Hi I am Colleen Pollock from Duncan,Oklahoma. 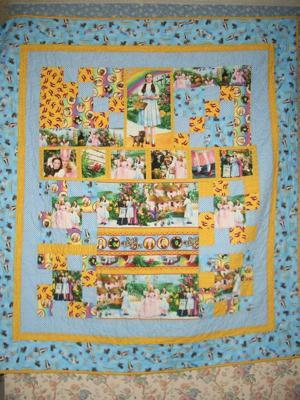 I recently sent Jackee pictures of the quilts I have made using the Wizard of Oz fabrics from Quilting Treasures. I thought you might enjoy the journey I have taken since discovering this collection of inspirational fabrics. My youngest daughter Kayla got married in 06. Her husband sang Somewhere Over The Rainbow to her as a surprise at their wedding. The Wizard of OZ has always been a favorite to us but especially to Kayla. They moved from Oklahoma to Albuquerque, N. M. which is 9 hrs away. On a trip to Oklahoma City to take her for a return flight to ABQ, we soothed our sadness at her leaving by going to Oklahoma Quilt Works, a wonderful quilting store. The first thing I saw was the Wizard of Oz fabrics and decided then and there to make a quilt for Kayla for Christmas. I had so much fun making hers that with the left over fabrics and some added purchases I also made one for each of my grand daughters. I started in October and worked right up to Christmas to finish them. Also my 10 yr old grand daughter got a Dorothy outfit including the sparkly red shoes for her American Girl Doll. After Christmas I decided to make myself a quilt from each of the collections, four so far and two more coming out in June 09 and Jan 10. I do not use patterns, only let the fabrics speak to me and I create as I go. Each one is a custom design. I hope you enjoy my Journey to the land of Oz.